I am a 71 year old Veteran who, until recently, was homeless. Through the interdiction of your office in Punta Gorda, and the help of organizations like Jewish Family and Children’s Services, The Punta Gorda Veterans Village, and the VA’s Hud/Vash program, I have been able to find permanent and affordable housing. When confronted by demands from the HUD office, to provide documentation from the IRS that was impossible for me to obtain, I turned to your office in Punta Gorda for help. I was graciously received by your staff, who gave that help with enthusiasm and dispatch. Within 48 hours, and with the help of a Congressional liaison named Linda Berkman, I received the necessary documentation in the mail. This is supposed to be the way America works, but all too often, does not. I am grateful to your staff for their assistance, and for the gracious demeanor with which that assistance was given. During my months of homelessness, I was exposed to the system, on many levels – good and bad, through which homeless Veterans struggle to navigate, with the hope of eventually finding permanent and affordable housing. 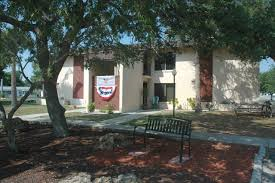 From the VA’s Medical Center in Bay Pines, to local transitional housing situations like Stillwater House in Port Charlotte, and the Punta Gorda Veteran’s Village, run by the Volunteers of America; and the VA’s Hud/Vash program, I have lived through it, and thought it my responsibility to share my experiences, both positive and negative, with your office. The positive aspects of my transition from homeless Veteran to affordably housed Veteran should be applauded; and the negative aspects, so desperately in need of fixing, need to be fixed. The plight of the homeless Veterans has become a media-intensive issue in America, and it seems only right and just to bring my own experiences to the attention of my Congressman, particularly since that Congressman’s office had been so helpful to me. So, here is an outline of my journey, good and bad, from homeless to affordably housed. But first, let me preface this description by explaining that homelessness has been on my horizon for the last two years. Because, for most of my life, I was self employed, my Social Security stipend is quite small, and impossible to live on. Supplemental income that had enabled me to pay my monthly bills dried up, leaving me with a deficit at the end of each month, and I was aware that those months had become numbered. During the past few years I have sought the help of many VA representatives who have given no help whatsoever. Prevention of homelessness seemed to have no place in the VA’s agenda, while chronic homelessness was a different matter. I saw a man named David Donohew on three separate occasions. He ran the Veterans Office at Charlotte County Human Services. Donohew seemed like an affable and friendly guy, but each time I saw him he told me the same thing, “Come back and see me when you’ve been homeless for one year. Then I can help you.” This made no sense to me. By not preventing homelessness, the VA was exacerbating the situation. I needed to get into the VA’s system, in order to profit by it. And so I did. 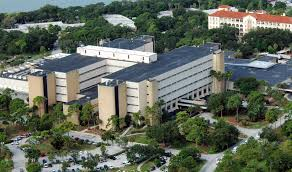 On April 14 of this year, then officially a homeless person, I checked myself into the Psychiatric Unit at the VA’s Medical Center in Bay Pines Florida. I would spend nine days in this facility. The staff, from top to bottom, seemed experienced and capable. I saw a psychiatrist and a social worker every day I was there. They were goal oriented and the goal, in my case, was finding permanent, affordable housing. Most of the patients suffered from drug and alcohol addiction, or combat related conditions like PTSD. I suffered from none of these problems. I just needed an affordable place to live. The psychiatrist was eager and focused on getting me into some kind of transitional housing so that I could resume my life. The social worker was enthusiastic but inexperienced, so that she needed constant back up for any questions or problems. She wanted to help me find housing, but had no real world knowledge of what that housing would be. The nursing staff, without exception, were attentive, and caring. There were Veterans at this facility with serious problems and they seemed to be getting serious care. Two days before I was discharged, the social worker told me that she had found me transitional housing in Port Charlotte, where I had lived for the last ten years. This seemed like good news. The problem was that the social worker had never visited any of the facilities she was to recommend, so she relied on the opinions of the people who managed them. I was to go to Stillwater House, a transitional housing facility subsidized by the VA, and live there while I attempted to find permanent, affordable housing. I was excited at the prospect, having listened to the glowing description of the place from the eager but inexperienced social worker. I was told that my all-inclusive rent would be $300, which seemed reasonable enough. 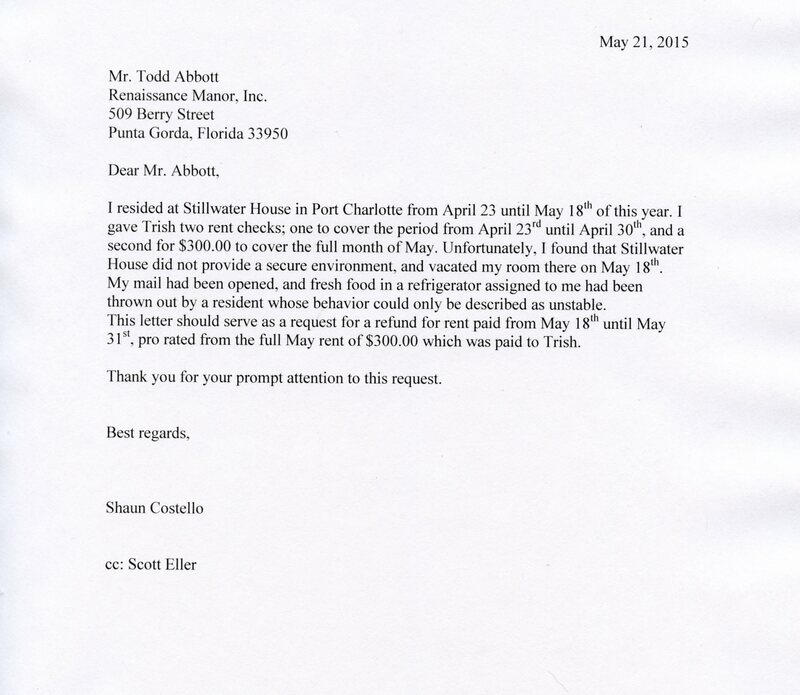 The letter I sent to Todd Abbott at Renaissance Manor asking for a refund. I sent it three times. The letters were ignored. On April 23rd I was discharged from the Bay Pines facility and headed south to Port Charlotte. I arrived at Stillwater House about Noon that day. It was a small, two story building located in the center of Port Charlote, close to the library, the Cultural Center, and the local hospitals. I was greeted by a woman named Trish (I never knew her last name) who showed me a few of the available rooms. I was stunned. The rooms were tiny, dirty, and decrepit. Trish then announced that I needed to give her a rent check for the $500. I was to pay each month. I was horrified. I immediately got on the phone with the social worker at Bay Pines, who had bought Trish’s glowing description of her venue, and told her the reality of this place, and the $500. that Trish was trying extort from me for rent. She called back, giving me the name and phone number of Gilbert English, who she claimed would be able to help me. She also told me that the rent would be $300. and to pay no more. I chose the least offensive room, gave Trish a check for the pro-rated portion of the month’s rent, and got on the phone with Gilbert English. He seemed friendly, and told me he would meet me an hour later at the Coalition for the Homeless in Port Charlotte. Gilbert English turned out to be my salvation. I spent about an hour with him, during which time he gave me several names and phone numbers, and the order in which I should call them. For any homeless Veteran who might wind up reading this document, and who lives in this part of Florida, Gilbert English is the man to see. His number can be found through any VA social worker. The first person on Gilbert’s list that I called was Michelle Hammond at Jewish Family and Children’s Services, a well funded, Veteran-friendly organization that Gilbert said could provide help. The second was a man named Tom Yanoti, who worked at Punta Gorda Veteran’s Village, a transitional housing facility. I spent an hour with Michelle the next afternoon, providing her with personal information, and making a list of the documentation that would be necessary for me to provide in order to receive their help. I then stopped by Tom’s office and got on the waiting list for space at Veteran’s Village. Stillwater House appears to be a storage venue, where needy Veterans are shelved and forgotten. For the next three and a half weeks I would live at Stillwater House, while every day setting up and going to appointments with the objective of obtaining affordable permanent housing. At 8AM on the day following my appointment with Gilbert English my phone rang. It was Gilbert, checking up on whether I had called the numbers he had given me. He was pleased to find that I had two appointments already, and rewarded me by letting me know that he had given my name to the Hud/Vash office in Bay Pines in order to get me into the Hud/Vash System. This was good news since Hud/Vash was the portal to a Hud voucher, which would enable me to obtain affordable housing. Gilbert is a relentless advocate for his Veterans. Life at Stillwater house could best be described as problematic. Stillwater House exists under the corporate umbrella of Renaissance Manor, both being non-profits that are federally subsidized in order to provide low cost housing and care for those in need, primarily Veterans. As at the psychiatric unit at Bay Pines, most of the Veterans at Stillwater House are substance abusers, or have serious psychiatric problems requiring care. Unfortunately, at Stillwater House, care is the very last thing they receive. Not once, in the three and a half weeks I lived there, did I see the presence of a single medical professional of any kind. The facility is completely unsupervised. This is tragic because most of the men who live there are in need of psychiatric counseling. Instead of providing care for its residents, Stillwater House appears to be a storage venue, where needy Veterans are shelved and forgotten. My first week there, one of the Veterans told me that I had mail, which could be found on a table in the lobby. It was one of those super strong plastic envelopes that the VA uses to ship pharmaceuticals, impossible to open without a knife or scissors. When I picked it up I noticed that it had been cut open. Every Vet knows these containers, and that they contain prescription drugs. Someone, one of the many substance abusing residents, had sliced it open hoping to find recreational drugs. None of my prescriptions fit that description, so nothing was missing, but I was disturbed that someone had violated my mail. I waited a few days, giving myself time to think it over, and decided that it should be reported. I called Trish at Renaissance Manor. I told her that something disturbing had happened and that I would like to discuss it with her in person. She demanded to know the nature of the event, but I insisted that it was not a matter for telephone discussion. She said that she was quite busy and couldn’t see me. I then called her boss, a man named Todd Abbott. He was not in and I left several messages on his voicemail. The next day, I assume because Todd Abbott told her of my calls, Trish called me and told me to come to her office at Renaissance manor in Punta Gorda. When I told her of the opened mail, she was defensive, dismissive and adversarial. She seemed angered that I was reporting a problem, almost as though by reporting it, I was creating it. It seemed that Stillwater House was a mess that she did not want to deal with. Later that day Todd Abbott called me and had basically the same attitude. Problems at Stillwater House? Ridiculous. Abbott made some vague suggestion that he would do something about it, but of course, never did. So the Veterans at Stillwater House, many of whom were in need of counseling and care, continued on without it, shelved and forgotten, victims of a corrupt bureaucracy, and the laziness of management. There were many incidents during my stay at Stillwater House that were a result of behavioral problems exhibited by needy Veterans, too many to mention here. Stillwater House, in my opinion, should either be closed, or placed under new management. These men need care. During the next few weeks I was relentless with Tom Yanoti, stopping by his office every other day, reminding him that I was his next best tenant. Veteran’s Village appeared to be a well run facility, and I desperately wanted to move there. I quickly moved up on the waiting list, and moved into apartment 221 on May 18th. The next day I sent an invoice to Todd Abbott at Renaissance Manor, asking for a refund of the rent I had paid for the month of May, which I had paid in full on May 1st. My request was for that pro-rated portion of the month (13 days) that I was not in residence, having moved to Veteran’s Village on May 18th. It is now August and I have sent Todd Abbott three invoices, with cc’s to his boss Scott Eller. They have gone unanswered. So, the management of Stillwater House are not only abusers of Veterans in their care, but are deadbeats as well. Why am I not surprised. Veteran’s Village takes up four two story buildings and houses up to forty Veterans. Punta Gorda Veteran’s Village would become my home for the next month, and was an altogether different kind of facility. 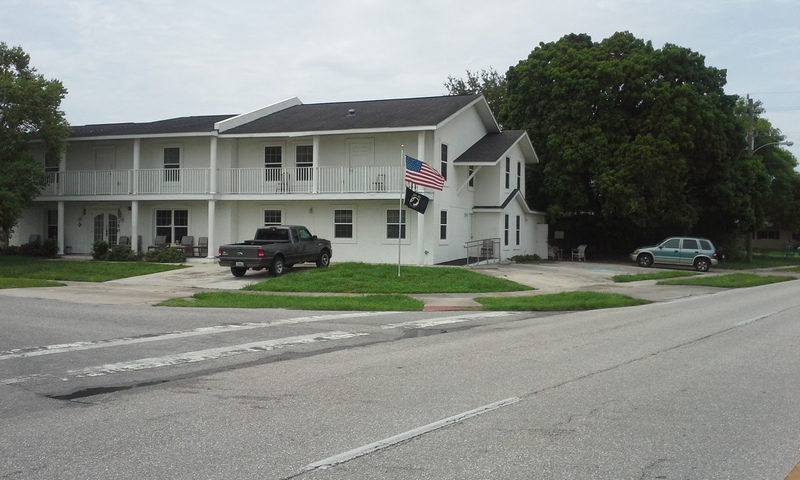 Located on Taylor Street in Punta Gorda, the Veteran’s Village takes up four two story buildings and houses up to forty Veterans. It even has a swimming pool. Like Stillwater House, Veteran’s Village houses many Veterans with drug and alcohol problems and psychiatric disorders. But unlike Strillwater house, here the Veterans are offered the care they need. The manager is Kerrie Wilson, who has a difficult and sometimes thankless job to do, and does it well. Homeless Veterans can be a disgruntled and difficult group, who can, and sometimes do, lash out at those who are trying to help them. During my time there I saw Kerrie fall victim to much undeserved criticism from Veterans she was trying to help. I found her to be a caring, even loving overseer of a difficult bunch. Two days a week Kerrie receives help from Linda Briggle, a small woman with enormous energy, who, when confronted with a problem, simply rolls up her sleeves and attacks it. One day a week Kerrie and Linda are joined by Barbara Sousa, whose official title is: Grant Per Diem Liason/VA Homeless Program. (Liaison is misspelled on her card) Barbara acts as liaison between the Village and the VA. She is knowledgeable, and offers Veterans help navigating their way through the sometimes complicated maze of the VA bureaucracy. I will be forever grateful to these people for the help they gave me and the care they showed me at a time when I needed both. At Jewish Family and Children’s Services I was turned over to a woman named Mindy Saldana, who would become my case worker. Mindy is a tireless and caring advocate for those in her charge. During the following month, JFCS would pay almost a thousand dollars to have my car repaired, purchase a new bed for the apartment I would eventually obtain through Hud/Vash, pay the security deposit on that apartment, as well as deposits for utilities, and supply my new apartment with many household items. JFCS, an organization I previously was unaware of, would become an integral component in my return from homelessness to a normal life. Obtaining a HUD voucher should be the goal of any homeless Veteran who is serious about permanent housing. Navigating the VA’s Hud/Vash system is not without its difficulties, but if you are resourceful and determined, it can provide a homeless Veteran with the road to affordable housing. My Vash case worker was new at his job, so I took it upon myself to make sure that the HUD people were provided with the enormous amount of documentation they require in order to qualify for their help. The Vash personnel are the VA’s liaison to HUD, which holds the purse strings for housing. HUD has the power, and power corrupts, so I found the HUD people a bit arrogant to deal with. They hold all the cards and they know it. My advice to any Veteran going through this process is to remain patient, but to be determined and persistent. Do not wait for anyone to do anything for you – do it yourself. After several interviews with HUD personnel, during which I had to provide, in my opinion, a ridiculous amount of documentation, I was granted a HUD voucher. It was now up to me to go out into the community and find available housing that my HUD voucher would pay for. This was no easy task. The voucher is County specific. I live in Charlotte County where the availability of affordable housing is quite limited. I was able to obtain lists of apartment complexes that were Hud-friendly and got on many waiting lists. The HUD voucher has time constraints. You have three months from the date the voucher is issued, to obtain appropriate housing. If you do not, then the voucher becomes invalid. So I pounded the pavement in search of an appropriate apartment. By sheer luck, I wound up at the Charleston Cay apartment complex in Punta Gorda. The manager Keith Livermore, told me that there was a six month waiting list, and asked if I was a Veteran. When I answered yes, he told me that Veterans go to the front of the list. Within two weeks I had a two bedroom apartment. 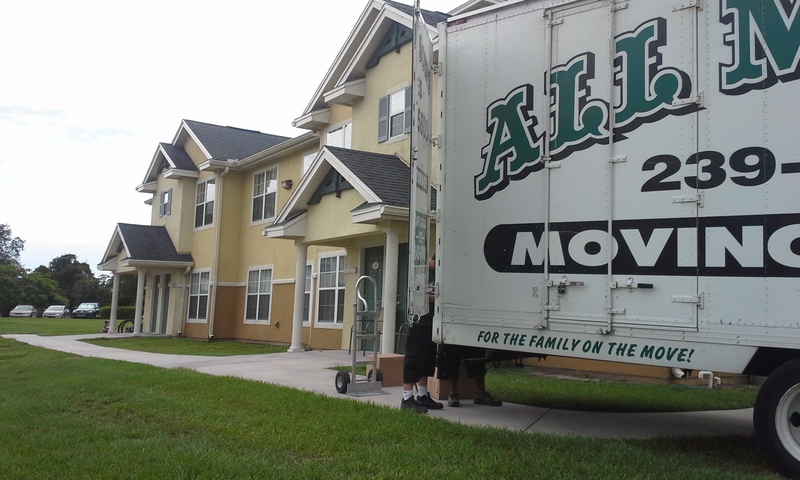 I moved in to the Charleston Cay complex on July 25th. Moving into my new apartment. The move was paid for by JFCS. My journey, from checking myself into the VA’s psychiatric facility at Bay Pines, to moving into my new apartment took three and a half months. I had to navigate my way through the mine fields of bureaucratic obstacles that lay waiting for any pilgrim who undertakes this process. I received so much help along the way from friends, family, and the organizations I have mentioned here, for which I shall be forever grateful. To any homeless Veteran reading this epistle, who wishes to undertake the same journey, I would give this advice: You’ve got to want it to make it happen. Do not get discouraged. It’s not easy. Stay the course. You’ve got to be determined and persistent. Do not take no for an answer. If I could do this, so can you. 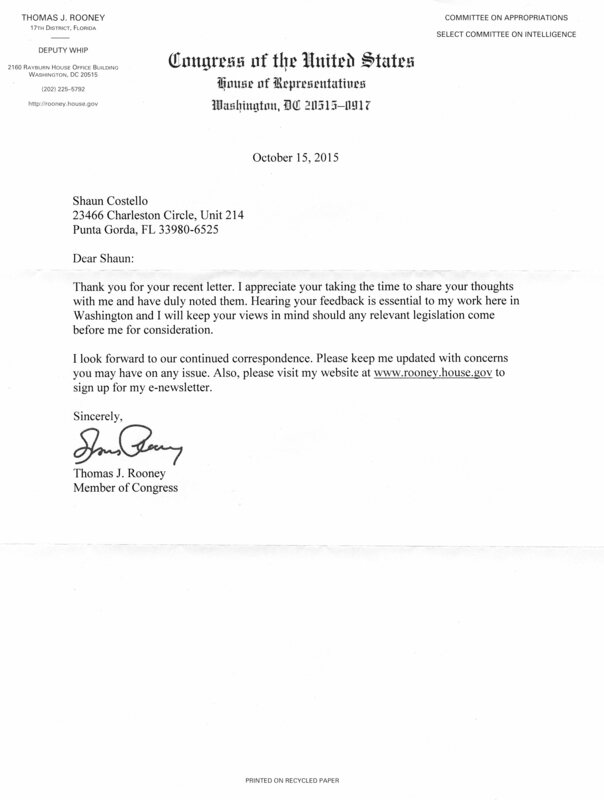 I send this chronicle to you Congressman Rooney, with the hope that your good office can take the lead in Congress to eliminate the problem of homeless Veterans in America. I hope that becoming aware of my personal journey, will inspire you to take action. To help and federally fund those organizations that are so helpful to homeless Veterans like; Jewish Family and Children’s Services, The Punta Gorda Veterans Village, and so many others. And to defund and close down facilities like Stillwater House, a storage venue for Veterans in need, who are ignored and forgotten while in residence. I took a great deal of care in crafting the above letter. I thought my Congressman should be made aware. This is the unfortunate form letter I received in response. So much for Congressmen caring about Veterans. This entry was posted on August 4, 2015 by shauncostello. It was filed under Fiction and non-fiction from Shaun Costello and was tagged with Abuse of Veterans, affordable housing, Barbara Sousa, Charleston Cay, Congressman Thomas J. Rooney, David Donohew, Gilbert English, Homeless Veterans, Homelessness, Hud, HUD vouchers, Jewish Family and Children's Services, JFCS, Keith Livermore, Kerrie Wilson, Linda Briggle, Michelle Hammond, Mindy Saldana, obtaining affordable housing, Ovecoming homelessness, Punta Gorda Veteran's Village, Renaissance Manor, Scott Eller, Stillwater House, Stillwater House abuse of Veterans, Stillwater House nightmare, substance abuse, The homeless, The Homeless Problem, The Hud.Vash system, The VA Bay Pines Medical Center, The Veterans Administration, Todd Abbott, Tom Rooney, Tom Yanoti, Volunteers of America. Reblogged this on Dave's Strange World. One hell of- an odyssey, but not unusual. Boston, where I live, has a number of Veteran Shelters that house homeless vets for up to a year and sometimes more. It relies on private donations. Shaun, if you were younger and had the energy, you could become a third party facilitator to help folks like yourself. I’m glad you appear to have been through the worst of it! I survived with the help of friends like you, Michel.